Veeam is once again blessing the community with their generous holiday spirit, which of course includes gifts! Veeam recently launched version 6 of their flagship Backup and Replication product which now includes support for Microsoft Hyper-V. Those who are heavily active in the Microsoft and/or VMware community and formally recognized as such, are eligible to register for their free gift from Veeam – NFR licensing for Backup and Replication v6. I will attest that I’ve been using Veeam Backup & Replication to protect valuable data in my home lab for a few years and I’ve had to rely on it for recovery more than once. I also included it as a backup and disaster recovery replication solution in my VCDX design submission which I successfully defended in February 2010. Get this holiday gift from Veeam! If you are a Microsoft Certified Professional (MCP), Microsoft Certified Technology Specialist (MCTS) or a Most Valuable Professional (MVP), you can get a FREE 2-socket NFR* license for Veeam Backup & Replication v6 for your home or work lab. *An NFR (Not for Resale) license can only be used for evaluation or demonstration purposes. Read EULA for more details. If you are a VMware vExpert, VMware Certified Professional (VCP), VMware Certified Instructor (VCI) or VMware User Group (VMUG) member, you can get a FREE 2-socket NFR* license for Veeam Backup & Replication v6 for your home or work lab. In the past couple of weeks I have spent some time with VMware vCloud Director 1.5. The experience yielded three blog articles Collecting diagnostic information for VMware vCloud Director, Expanding vCloud Director Transfer Server Storage and now this one. In this round, the vCD cell stopped working properly (single cell server environment). I could log into the vCD provider and organization portals but the deployment of vApps would run for an abnormally long time and then fail after 20 minutes with one of the resulting failure messages being Failed to receive status for task. Doing some digging in the environment I found a few problems. Problem #1: None of the cells have a vCenter proxy service running on the cell server. Problem #2: Performing a Reconnect on the vCenter Server object resulted in Error performing operation and Unable to find the cell running this listener. BACKUP the entire SQL Database. Before running the script I knew I had to make a few modifications to select the vCloud database first. When running the script, it failed due to case sensitivity with respect to the table names. Upon installation, vCD creates all tables with upper case names. When the MS SQL Server database was first created by yours truly, case sensitivity, along with accent sensitivity, were enabled with COLLATE Latin1_General_CS_AS which comes straight from page 17 of the vCloud Director Installation and Configuration Guide. The script ran successfully wiping out all rows in each of the named tables. A little sidebar discussion here.. I talked with @sqlchicken (Jorge Segarra, read his blog here) about the delete from statements in the script. It is sometimes a best practice to use the truncate table statement instead so that the transaction logs are bypassed instead of using the delete from statement which is more resource intensive due to the row by row deletion method and the rows being recorded in the transaction logs. Thank you for that insight Jorge! More on MS SQL Delete vs Truncate here. Jorge was also kind enough to provide a link on the subject matter but credentials will be required to view the content. These [vCenter Proxy Service] issues are usually caused by a disconnect from the database, causing the tables to become stale. vCD constantly needs the ability to write to the database and when it cannot, the cell ends up in a state that is similar to the one that you have seen. The qrtz tables contain information that controls the coordinator service, and lets it know when the coordinator to be dropped and restarted, for cell to cell fail over to another cell in multi cell enviroment. When the tables are purged it forces the cell on start up to recheck its status and start the coordinator service. In your situation the cell, due to corrupt records in the table was not allowing this to happen. So by clearing them forced the cell to recheck and to restart the coordinator. Good information to know going forward. I’m going to keep this in my back pocket. Or on my blog as it were. Have a great weekend! If you were at VMworld 2011 US and/or Europe, you may have seen or heard of the posters being given away at the Hands On Labs. Supplies were limited at the US conference and if you attended in Copenhagen maybe you didn’t get a chance to get into the labs to grab some posters. Although VMworld is over, you still have access to the posters. One way would be to request a Dell Compellent Executive Briefing with me. I brought a few pounds of posters back from Copenhagen and what’s mine is yours if you’re willing to listen to me talk about the great integration points Dell Compellent Storage Center has with VMware’s growing portfolio. The other option would be to go online and grab a copy of the posters which you can view electronically or have printed at your local copier shop. This blog post was inspired by Xtravirt email bulletin 94 – thanks for pulling together the links guys. I don’t publish the majority of the press releases which make their way to my inbox but I took a quick look at HotLink SuperVISOR for VMware and what it does is interesting. Watch the video below (feel free to expand to full screen to see the detail) and see how this product is able to pull in various Type 1 hypervisors in a heterogeneous datacenter under the vCenter management umbrella. By now you know VMware isn’t the only player in the hypervisor business. VMware’s competitors have been making their presence known. They remain persistent partly because of their gradual market penetration. And I’ll be the first to admit that the other hypervisors out there are the right fit for some business use cases and requirements. Also, multi vendor policies are not uncommon in large organizations. Whatever the reason, deploying different makes and models of hypervisors in an environment is your business. Managing them with ease is HotLink’s business. Read on. SUNNYVALE, Calif. – December 15, 2011 – HotLink® Corporation, the market leader in transformation solutions for heterogeneous virtualization management, today announced the newest release of its flagship product, HotLink SuperVISOR™ for VMware. HotLink SuperVISOR is the first and only solution to enable VMware vCenter users to natively manage cross-platform virtual infrastructure spanning Citrix XenServer, Microsoft Hyper-V, and Red Hat Enterprise Linux (KVM). The latest release, HotLink SuperVISOR for VMware 1.2, adds new capabilities focused on enterprise robustness, scalability, configuration and management of multi-hypervisors and workloads. Enhanced Networking Configuration – Users can now provision and modify virtual switches and network adapters from VMware vCenter and associate these to any enterprise hypervisor —enabling users to manage heterogeneous virtual networking from a single interface. Expanded Performance Monitoring – The latest release expands the heterogeneous performance statistics and alerts that are gathered and displayed inside the native VMware vCenter performance tab —allowing administrators to quickly identify issues across the mixed hypervisor environment. Robust Configuration of Virtual Machine Settings – Only HotLink provides the ability to modify the configuration of virtual machine settings such as virtual CPUs and memory assignments natively inside vCenter and apply across all virtual platforms —ensuring the optimum VM configuration regardless of the hypervisor. As virtual infrastructure deployments expand and mature, heterogeneity is being fueled by a combination of economics and maturing of hypervisor alternatives. The most recent Gartner Magic Quadrant for x86 Server Virtualization Infrastructure report included, for the first time, both Citrix and Microsoft alongside VMware in the leaders quadrant. Moreover, Hyper-V grew 62 percent last year compared to ESX’s 21 percent growth and Citrix’s 25 percent, according to IDC. While the proliferation of multiple virtual platforms is accelerating, streamlined infrastructure is needed to unify management. That’s exactly what the latest release of HotLink SuperVISOR for VMware addresses. With the new HotLink SuperVISOR technology, enterprises can tier their virtual infrastructure with cost-effective hypervisors and still unify the management, significantly reducing their licensing and operating costs. With HotLink SuperVISOR, customers can realize the benefits of mixed hypervisors while avoiding overly complicated management systems. “Like many other IT shops, we are investigating the use of multiple hypervisors to cost effectively support development and test activities for our Tier 2 and Tier 3 business applications. We have been very impressed by HotLink’s SuperVISOR technology and the hypervisor interoperability that it enables. We believe that HotLink will enable us to optimize the use of specific hypervisors for individual workloads without compromising our ability to manage our overall virtual environment,” said Mark Settle, CIO of BMC Software. HotLink SuperVISOR for VMware 1.2 is available now with pricing starting at $25,000. For more information, contact sales@hotlink.com or visit www.hotlink.com. Founded in early 2010 by data center software veterans and the founders of FastScale Technology, Inc. (acquired by VMware), HotLink Corporation is on a mission to transform real-world IT with the first true heterogeneous data center system management platform for virtual, cloud and physical computing infrastructure. Early customers include enterprise IT organizations spanning technology, financial services, telecommunications and Internet search. HotLink’s advisory board includes visionary leaders from Informatica, Facebook, E*TRADE, Clorox, Citrix, BMC and Flextronics. HotLink is a privately held, venture capital backed company based in Sunnyvale, California. For more information, visit www.hotlink.com. I’ve gone a few rounds with VMware vCloud Director in as many weeks recently. I’ve got an upcoming blog post on a vCenter Proxy Service issue I’ve been dealing with but until I collect the remaining details on that, I thought I’d point out VMware KB 1026312 Collecting diagnostic information for VMware vCloud Director. This knowledge base article details the steps required to collect the necessary support logs for both vCD versions 1.0 and 1.5.
cell.log – Console output from the vCloud Director cell. diagnostics.log – Cell diagnostics log. This file is empty unless diagnostics logging is enabled in the local logging configuration. vcloud-container-info.log – Informational log messages from the cell. This log also shows warnings or errors encountered by the cell. vcloud-container-debug.log – Debug-level log messages from the cell. vcloud-vmware-watchdog.log – Informational log messages from the cell watchdog. It records when the cell crashes, is restarted, etc. On the subject of vCD log files, also mentioned in the KB article is VMware KB 1026815 Configuring logging for VMware vCloud Director. The information in this article is useful for specifying the quantity and size of vCD log files to be maintained on the cell server. Once the log files have been collected, you may analyze them offline or upload them to VMware’s FTP site in association with an SR by following VMware KB 1008525 Uploading diagnostic information to VMware. 1) Create and send a 1 – 3 minute video, explaining who you are and how you think the lab would help you. 2) Shipping to US addresses only. 3) Employees of prize vendors and Cody’s tight friends are ineligible. 4) Entries must be received by midnight 12/13. 5) Winner will be announced between 12/14 and 12/16. 6) The very best of luck to all contestants and may the luckiest and most deserving person win. If you sue Cody or cause trouble for him you will be the biggest loser. Head on over there now & submit your entry! For the Twitter folks… (The Real) Mostafa Khalil (@MostafaVMW, VCDX #2) is now on Twitter. I’d recommend following him as there are some amazing changes brewing on the vSphere storage horizon. Hopefully he’ll privilege us on a semi regular basis with bits from his great storage mind. For the non Twitter folks… Seven days ago, Mostafa posted the picture shown below. 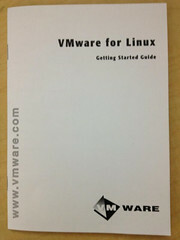 It’s the Getting Started Guide for VMware Workstation 1.0 for Linux. It comes to us from the year 1999. Seeing this is enough to make a vEvangelist tear up. I’d love to get my hands on this product at some point and take it for a spin. Perhaps I’ll have a chance if the VMTN Subscription makes its return. 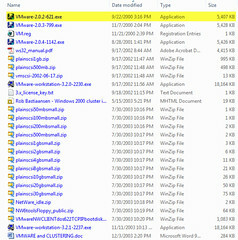 My VMware journey didn’t start until a year later with Workstation 2.0.2 for Windows. Look at the file size – 5MB.